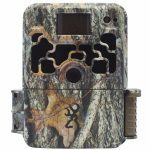 Wildgame Innovations Crush 360º Cam Trail Camera can not be easily compared to some of the other cameras we have looked at. While it has many similar features to other cameras, the 360° tracking capabilities is the feature that stands out, and will be a deciding factor if this camera is for you. In this review we are going to examine it’s 360° capabilities. Then we will look at how the camera’s more traditional features rate, such as the photo and video quality, durability and battery life. If you have a specific question you need answered check out our table of contents below to skip right to the appropriate section, or else just keep scrolling down to read our full review. 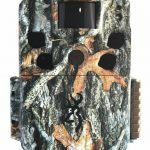 Wildgame Innovations’ 360 Trail Camera uses a motion sensor and Infrared Flash to keep an eye on the whole area surrounding the camera for day and night photography. The camera rotates to six pre-set spots as the animal or person it has detected moves about. So it has preset locations every 60 degrees to take photos or videos of an entire yard, field or feeding area. The motor that swivels that camera and flash is very quiet and fast. While the camera circles around to follow its target there is a small delay in taking pictures. Obviously, the camera doesn’t move instantaneously, so it’s not going to be ideal for tracking a fast moving animal or person, but when set up in a feeding area the speed is more than adequate to follow an animal around. The sound and movement are unobtrusive. Generally, animals don’t notice either. There are videos that show deer being tracked and while some of them might show some interest in the camera as something to investigate, the movement doesn’t spook them. One review did not that a young buck was alarmed by the camera and left a feeding area to never return, but almost universally in the reviews people note that this isn’t a problem. Setting up the camera to get the most of the dynamic 360º degree functionality is fairly easy to achieve. The camera comes with a custom T-Mounting bracket system that will allow you to attach the camera to post or pole. Attaching the camera to a pole stabilized by a cinder block is a popular method for mounting the camera. You can also attach the camera to a tripod. The camera comes with an adjustable strap and instructions for attaching it to a tree. You will still get some of the functionality of the camera’s tracking, but obviously with a tree taking up over 90 degrees of the surrounding visual field you will be limited. Still photos with the Wildgame Innovations 360º Cam are very good. The camera takes up to 12MP resolution pictures. There is the option for high, medium and low resolution. The R12i20-7 model of the Crush Cam has 36 high intensity Infrared LEDs. The flash has a range of 70 feet. If you are concerned about the visibility of the flash there is a Lightsout model available that offers more stealth features. Video can be recorded at the regular setting of 480P or in High Definition (HD) at 720P. The video quality is good but not great. One of the trade-offs you are making with this camera is a slightly lower quality of video recording. Two other possible drawbacks with this camera’s video are that it does not record sound, and there is only the default length of 30 seconds for video length. The camera has a fairly fast 1.5 second trigger when it is in PIR mode. The PIR sensitivity can be set to High, Regular or Low, and this is something you may have to test to get the best results with depending on the season and where you mount the camera. You can also set the camera to a 24 hour mode, where the PIR will automatically adjust between day and night. The camera can also be set to take pictures only during the day, or only at night. There is the option to have the camera take pictures 24 hours a day. Along with the PIR mode, which triggers the camera based on movement, there is a Flextime option. Flextime will trigger the camera at particular intervals depending on what setting you choose. There are three Flextime settings. The first shoots at set intervals from 15 minutes before sunrise to 1 hour after sunrise, and from an hour before sunset to 15 minutes after sunset. With the first setting the camera will only take pictures at these times. The second takes pictures at a set interval during the same time periods, but will use the movement sensor, PIR mode, to take pictures during the remainder of the day. The final mode, called Interval on the camera, allows you to take pictures at a set interval between 15 minutes before sunset and 15 minutes after sunset, and then the camera will work in PIR mode during the night. All three of these Flextime settings can also be coupled with PIR, in both mode. With the note that in the first setting the PIR mode is only active during the dawn and dusk periods of the time and the camera is inactive during the rest of the day. In the second and Interval mode coupled with PIR then the camera will take pictures at the designated intervals you set while also triggering from movement. There is a warning in the instruction manual that using the Both mode, will significantly decrease your battery life. 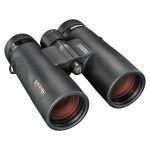 This was kind of confusing to us when we first saw it, especially compared to the more straightforward and modifiable Field Scan option of Bushnell cameras. 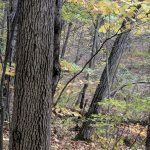 The camera has a Trubark texture that allows it to blend in to the surroundings fairly well. Since it’s not a traditional box shaped camera, the texture and shape make it seem more ‘natural’ and overall camouflages very well, especially against a tree. Standing in the middle of a field, it’s going to stand out to a person who comes upon it, but it does have a natural shape that will make it blend it for animals. The camera is very light at only 1lb. With the lightness it might take a little bit of extra work to stabilize the camera depending on how you mount it. The one big weakness to the camera is it’s average durability. 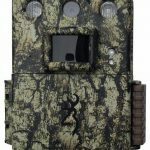 Compared to a regular camera it’s quite durable, but with the incredible durability of other trail cameras the 360º Crush is noticeably weaker. There are a number of reviews that point out that the camera had a hard time surviving multiple rainstorms. The shell appears to have a tendency to allow some water and condensation to be able to get into the camera can cause problems. The most frequent issue was that the lens begins to fog over from the condensation trapped in the camera. We couldn’t find any specs on the temperature range for this camera. But from reviewers have noted that the camera works well in hot and cold weather, and one reviewer said they had no problem with the camera operating in the cold of Northern Wisconsin. One other issue with durability is that there no place on the camera to attach a lock. We imagine that this is partially due to the design needed for the functionality, but out of the box there is no way to really secure the camera. Maybe with a little bit of imagination you can craft together a solution, but it’s something to keep in mind, especially if you are looking to mount the camera. Along with the Crush 360º Cam, you also get the T-Mount Bracket for setting up your camera. An adjustable strap that works well for mounting your camera to a tree. You also get the instruction manual, and image software to install on your computer. There are a couple of things that you will need to in order to use the camera. The camera takes 8AA batteries. Wildgame Innovations recommends that you use Alkaline batteries. The Crush 360º is advertised as having up to a six month battery life, but these statements should always be taken as the lifespan of the batteries if you barely use the camera and don’t use most of the features. In reality you should expect to get between a one and two months out of a set of a batteries. There is the option to attach an external battery pack. While this won’t save you any money on batteries it can worth the peace of mind to know that your camera isn’t going to run out of batteries between visits. You will need an SD card. The camera is designed to use up to a 32GB card, with one of those and regular visits to your camera you should have no worries about filling it up anytime soon. We recommend getting two cards, just for convenience we find it easier to switch them out when we get to the camera and then at home take the photos off of the first card and make more room. Another option is to get an SD card reader. 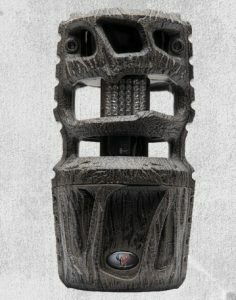 Customers give the Crush 360º Trail Camera a fairly high rating. There were some noteworthy comments made in some of the reviews. One customer said that the camera caught a person walking over 50 yards from the camera in clear motion picture. That gives the camera a very impressive range for it’s PIR sensor and the quality of it’s photos. Another reported that after a month in the field the camera took over 400 30 second videos and still had around 75% of it’s battery life remaining. Other positive reviews talked about the quietness of the cameras movement, how it didn’t spook the animals feeding near it, and the quality of the night photos in being able to make out dark animals clearly. The most common complaint about the camera was that it didn’t hold up well in bad weather. A number of people pointed out that condensation was a problem with the camera, and blurry pictures showing up from it. One pointed out that dew caused this, too. There are the usual complaints about battery life. Some people think the batteries drain too quickly. This is unfortunately an inescapable part of using Trail Cameras, if they are running constantly they are going run through batteries, and that can be costly. There were also complaints about the video quality. The camera can get glitchy when it records at HD setting and the videos can have a skipping quality to them. There is also the complaints about not being able to change the video length from the default 30 seconds. People are getting used to this option, so it’s noticeable when it’s not there. There was also a comment about the video format used. The videos are saved as .avi, instead of .m4v. Video formats are something I’m honestly not used to paying attention to, but apparently .m4v is less prone to errors and is a smaller file. Some reviewers also pointed out that the text on the display screen was so small that it was difficult to read. If you have trouble reading small print, then this is definitely something you will want to consider when making your decision. We recommend the Wildgame Innovations Crush 360º Cam, especially if you desire to have a panoramic view of anything from a backyard to a feeding area. Wildgame Innovations 360° camera takes the guess work out of choosing the perfect spot to set up your camera. It eliminates the fear of missing out on scouting an area (is there anyone else who has this fear?). While there are some durability and mounting issues with the camera, the 360° tracking and the picture quality outweigh these. There are quite a few people in reviews that give some great ideas for mounting the camera using some simple DIY materials. If you are looking to mount this camera in a traditional manner, such as on a tree, we don’t recommend this camera for you. There are higher quality and more durable cameras for a similar price that will meet your needs. You can check out our recommendations for those cameras in our other reviews. We also would recommend this camera, but with reservations for people who are more interested in recording video. Video is not this cameras strong point. If you are more interested in video, there are better cameras out there, although you might have to settle for a traditional stationary camera. If you are looking for a camera that can capture the entire 360º degrees of where you set the camera up we believe that this camera will be great investment.